We were completely remodeling the house we had just purchased and decided to let the kids choose their own paint colors. Their dad was a little worried and I'll admit, with the number of paint color choices out there the outcome could have been horrible. Well, our daughter decided she HAD to have pink. Of course, when you are 4, your world is nothing BUT pink! I honestly did try to talk her out of it and maybe go with a light green or a pretty yellow, but when a 4 year old wants a pink room, she gets a pink room. Otherwise you will get a pouty lip from her for quite a while. So I went all in and finally let her pick the pink. And boy was it pink! In an effort to turn down the bubble gum of it all, I only painted the top half of the walls and decided to keep the bottom mostly white. Just to break up the solidness of the white, however, I hand-painted vines in a light green as an accent. It was inspired by the trim we found that had an ivy pattern in it. She loves butterflies, so after finding the perfect quilt for her bed, I set out to give her room a sort of "garden-y" feeling. The flowers and butterflies on the bedding, coupled with the vines and butterflies on the wall, made it all come together perfectly! It all was very balanced with not too much of one thing. After repairing a couple of spots in the drywall, I sanded and cleaned the surfaces prior to painting. I used Behr with the primer in it and it only took one coat to cover the already white walls. I got the eggshell paint finish since it was for our child's room. It makes it easier to wipe off anything dirty little hands leave behind. It does show the imperfections of the walls, however. All in all, the entire project took me a few days to complete. But it turned out great and best of all... she loved it! Love the stencil work and the curtains! You did a great job with this room, and made the wall color work. 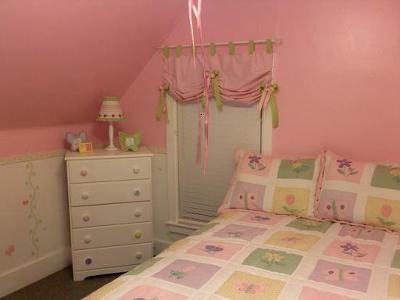 The way you decorated the room makes the color look very girly and not Pepto Bismo at all! What's missing here is some framed artwork on the walls with wide white matting or white backgrounds. Other than that, the room is picture perfect... I give it 5 stars. So cute and sweet. I love this. I wish I could have done this for our baby girl. My son was not too happy about sharing one-half of the room with his sister’s side painted all pink. Now even I feel yours was the better option and that would look good. Thank god, they are not here to see this now.